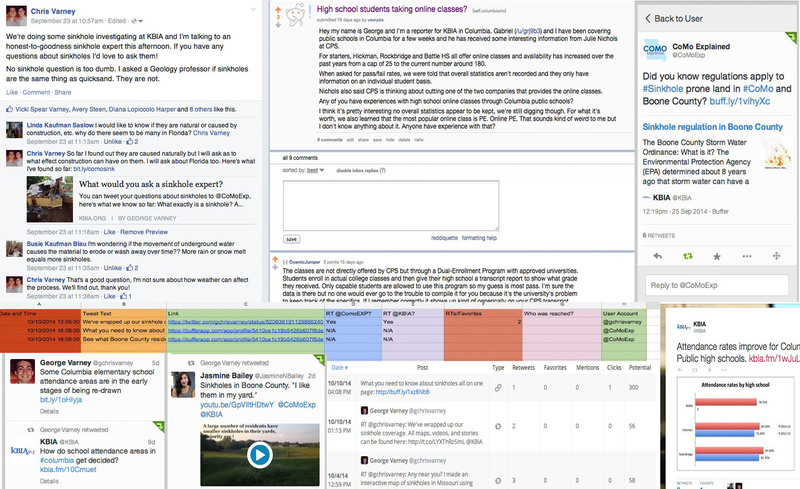 Above: A sample of the various social media platforms used throughout the project, including Reddit, Twitter, Facebook and Buffer. A team of three senior journalism students at the Missouri School of Journalism created this project. All findings were made public through the Columbia, Missouri NPR affiliate station KBIA. The class, Emerging Technologies in Journalism, challenged the team members to explore rapid iteration through multimedia story telling. The team explored different methods to disseminate information from social media, video, to interactive graphics. Each team member had previous experience and is skilled in different forms of multimedia story telling, allowing them to learn from each other. Each member was proactive, hard working, focused and excited about trying new methods. They all worked well together and shared leadership roles. Through the above links you will find projects the team completed and the methods they used to accomplish their goals. You can also find how-to tutorials and biographies on each member.